When I perform “Set-AdSiteLink” with “MaxMessageSize” parameter in Exchange 2010 Management Shell, it failed to update the setting. Active Directory operation failed on <Server name>. This error is not retriable. Additional information: Insufficient access rights to perform the operation. To solve this problem, you need to assign the permission of “Exchange Trusted Subsystem” on the “Site-Link-Object”. 1. 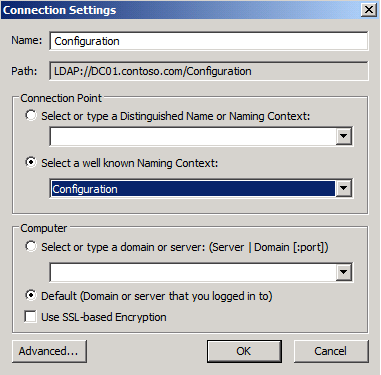 At a domain controller, log in as Enterprise Administrator. 6. 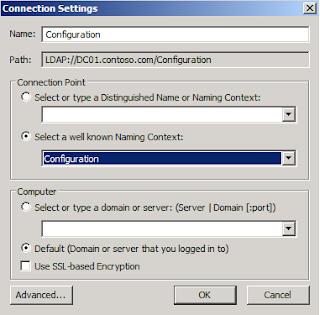 Expand "Configuration > CN=Configuration,DC=contoso,DC=com > CN=Sites > CN=Inter-Site Transports > CN=IP". 7. Right-click "CN=IP", select "Properties". 8. Select "Security" tab, click "Advanced". 10. Enter "Exchange Trusted Subsystem". 11. Next to "Apply to", select "Descendant Site Link objects". 12. Check "Allow - Read all properties, Write all properties and Read permissions". 13. Click "OK" three times. Now, you can update the "MaxMessageSize" on "AdSiteLink".